Not a night for fairytales then, the Lansdowne din reduced to little more than dice rattling around a biscuit tin. Iceland were simply too stoic, too muscular to entertain the idea of young men in green living out their childhood fantasies. So they won a game that offered Ireland little enough solace beyond maybe the impression made by Daryl Horgan in half an hour of gusting optimism down the left flank. The former Dundalk man and Callum O'Dowda were the pick of a support cast sent in by Martin O'Neill to breathe life into a game that was, largely, without a beating heart. Few occasions in football feel quite as arid and soulless as poor international friendlies. They service a multiple of small, personal agendas without ever feeling entirely relevant in the grand scheme of things. Iceland did carry to Dublin the marketing hook of a prolonged run at last year's Euro finals, but many of their best players were missing here and - Viking thunderclap apart - they were about as exotic a bunch to host as librarians gathering for a reading. Their manager, Heimir Hallgrimsson, promised high energy at least and they did deliver that. But the game still felt a kind of twilight zone between last Friday's elemental collision with Wales and the resumption of World Cup duty next June. It simply had no tension and, accordingly, no pulse. Maybe Seamus Coleman's wretched injury asterisked everything too. It seemed almost inappropriate to be back here feigning normality so soon after witnessing the Irish captain's right leg snap so horribly. So the whole thing felt a little forced, a little artificial. And maybe the idea of stadium trumpeters and drummers deployed to play puppeteer with the crowd simply added to that impression. An Irish football crowd has seldom needed official direction to help it communicate support for the team, so a cynical ear might suspect an element of thought control at play here. Some kind of gentle nudge towards positivity when the attitude in the singing section has of late, well, been ever so slightly contrary. As it happens, they seemed almost to appreciate the diversion this time, given so little else was occupying their attention. invigorate It all rolled passively by, both managers fishing deep into their pools of available talent to assess the quality beneath their first choices. In some cases, far beneath. We had wondered if an early goal might invigorate things and Iceland duly scored one in the 20th minute when, John Egan adjudged to have fouled Finnbogason on the edge of the box, Bristol City's Magnusson left Keiren Westwood frozen to the spot with a sweetly-arced free-kick inside the goalkeeper's left post. There and then, startlingly, the game was settled. Ireland's skeleton crew, we discovered, had no counter-punch; Iceland's had attitude and structure. Euro 2016 was, clearly, a positive experience for both countries but - in the visitors' case - it's fair to say the tumult raised ran deeper than any rowdiness stirred here. Actually, the earth appears to have moved for many Icelanders judging on reports that the maternity ward at Landspitali University Hospital in Reykjavik reported administering a record number of epidurals over the weekend coinciding exactly with the nine-month anniversary of their country's 2-1 victory over England. In some parts of the world (not naming names), great soccer journeys are celebrated with sing-songs and drink and broadly-defined bedlam. In Iceland, it appears the appetite is more for the soft click of a bedroom door closing. And they pretty quickly acquired that cigarette-on-the-pillow look after Magnusson's goal, Ireland unable to stitch enough passes together to create even a semblance of danger. 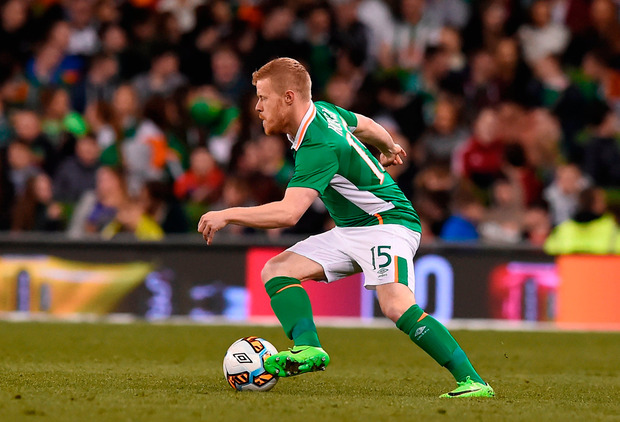 Not a massive surprise maybe given only James McClean and Jeff Hendrick were regular international starters for O'Neill, yet the manager had to be disappointed at a complete dearth of even the remotest creative impetus discernible in those chosen. Iceland were well drilled, organised, aggressive. Everything they needed to be. Ireland's debutants, Egan and Conor Hourihane, were doing fine without, in Hourihane's case, really doing anything. The game just seemed to be rolling by indifferent to his exertions. Maybe that's what happens when your opponent is simply more tuned to this level of football than you. Johnny Hayes was probably best of the starters, a bristling, energetic presence down the left flank without ever quite causing a jolt to Icelandic hearts. Ireland did open the second half like a team with angry words ringing in their ears, but that energy quickly dissipated. And soon the crowd grew, audibly, restless for a glimpse of Horgan, their wish being granted just after the hour when, to loud approval, the former Dundalk winger went galloping in to replace Hayes. It was one of four changes O'Neill made in one fell swoop, clearly anxious to reset the energy in the team. It worked to a point, Horgan swinging in at least four left-wing crosses that might have drawn profit from heavier Irish presence in the box. The numbers just weren't there though, Iceland seeing out things with the impassive calm of men who could see art in the business of defending crosses.